Congratulations Steaua - Fan of the Year Award Winner! The event saw star names such as Steve Clarke; Denis Law and Andy Robertson picked up trophies within their respective categories, but, it was the achievements of one Pars fan which has caught the attention of many. Marvyn Stewart, also know as Steaua from the forum section of this website, has volunteered and aided the club in many ways before and after administration hit the club in 2013. However, in most recent times, she has caught the attention of many - both Pars supporters or opposition supporters who attend East End Park. Initially, the venture started out by selling old match-day programmes, football kits or other such memorabilia that was donated to Marvyn. It was clear very early on, though, that this would be no short-term solution for her beloved Athletic. After moving premises to the corner of the Main Stand, the Emporium has gained much welcomed recognition far and wide; up and down the country. The dedication of Marvyn could never be questioned: despite having other priorities in life and voluntarily giving up her own time, she has bonded together a group of helpers who cook, sell or do anything else that needs done. These days, you`ll traditionally see Steaua advertise her opening times on the forum - yes, it isn`t just match-days that she opens her doors!! To have regular custom throughout the week when there`s not many people at the stadium emphasises the incredible feat which has been achieved. It is a superb award for the club and I would like to include all the volunteers who have worked in the Hub since it opened. To think I started it with just four shirts (from Netta McKenzie) and the Dunfermline Athletic Supporters Club (DASC) kindly gave me their wee office to sell the shirts out of and it has just snowballed from there. We have given the club £50,000.00, up to now, with the hope we can continue. I am very proud to have received this award and I would like to thank everyone for their support and voting for me." 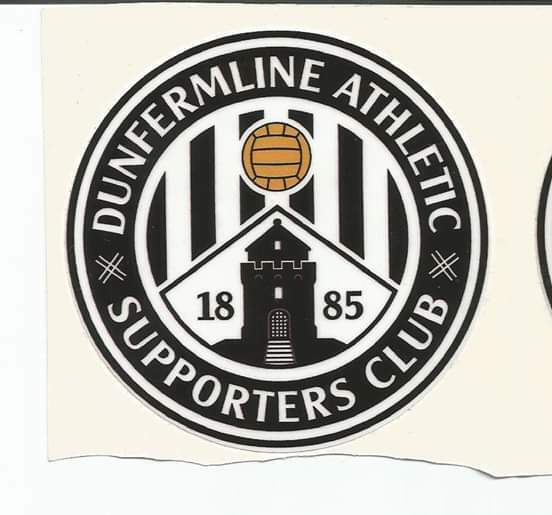 A thoroughly deserving winner of the `Fan of the Year` award from the SFSA - it shows the high regard Marvyn is held in amongst the fans of Scottish football and the terrific work she is doing on behalf of DAFC. 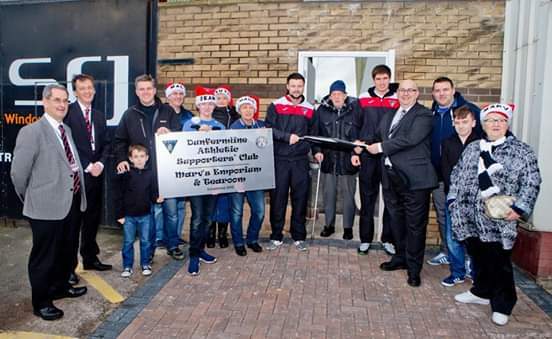 From everyone here at dafc.net, we`d like to congratulate Marv on her fantastic work and wish her every success for the future with the continued fundraising she will undoubtedly achieve. Find below the full Press Release from the SFSA. The SFSA’s Fans Awards were run in partnership with GambleAware, the leading charity in the UK committed to reducing gambling-related harms. Clarke won the manager of the year award ahead of Ayr United’s Ian McCall who was voted into second place, both ahead of Celtic’s Brendan Rodgers who was third. Scotland captain Andy Robertson was named as the Scottish men’s player of the year with Erin Cuthbert, an outstanding performer in Scotland’s qualification for the Women’s World Cup, named as the women’s player of the year. James Forrest was runner up in the men’s player of the year award and Jen Beattie runner up in the women’s. The poll carried out by the SFSA saw nearly 2000 votes cast. ‘Goal of the Year’ went to James Forrest for his fantastic second goal against Albania in Scotland’s’ 4-0 victory in Shkodër. Adam Hammill’s incredible strike for St Mirren from inside his own half in a 2-2 draw with Hibs was voted as the second best. In an incredibly difficult category, Dunfermline Athletic fan, Marvyn Stewart was chosen as the Fan of the Year award winner. Since the club fell into administration, Marvyn has raised over £50,000 for her club through numerous fundraising efforts. Joint top goalscorer for the Scotland international side and Manchester Utd legend, Denis Law received a Lifetime Achievement Award in recognition of his contribution to Scottish football. A Special Achievement Award has been made to Shelley Kerr, Scotland’s Women’s team manager, for guiding Scotland to the World Cup finals in France. Scotland’s ‘Best Ref’ was named as Craig Thomson who beat John Beaton and Steven McLean to the title. Aberdeen fans were knocked off the top spot this year by Hibs fans who were named as the country’s top travelling fans. Hearts fans were named as runners-up with the Dons fans coming third. St Johnstone’s McDairmid Park was the most family friendly ground closely followed by Ross County’s Global Energy Stadium and St Mirren Park coming third..
Tynecastle retained its position as the ground most away fans like to visit for the third year in a row with Ross County as second favourite, ahead of Kilmarnock’s Rugby Park. For the third year running, Mascot of the Year went again to Partick Thistle’s Kinsgley. Michael Stewart retained his top position in the fans’ Best TV/Radio pundit keeping Chris Sutton in second spot. Steven Thompson was recognised for the first time as the fans’ third favourite. Fans’ favourite sports writing was picked up by popular micro blogger OldFirmFacts1, knocking Tom English into second spot. The cast of the Burst Baw podcast were third. The SFSA is a not-for-profit, members’ body open to everyone, whether they are individuals, supporters groups or affiliates. It currently has over 70,000 members. This is its third Scottish Fan Awards poll. The SFSA can be found on Twitter @scottishfsa or through #reclaimthegame and on Facebook. For further information on the SFSA and the Fans Awards, please contact Paul Goodwin on 07702-252519. Fire And Ice Can Make Things Nice!